several dining can be found right in the middle. Kitchen open to living room is North-West oriented, bedroom with adjoining bathroom, shower toilet north side and therefore pleasantly cool in the summer months. It should be noted that the small 40 sqm apartment is only about 2,05m high. The terrace has morning and late afternoon sun after a hike or bike ride can be enjoyed relaxed until sunset in the west. We offer optional morning bread delivery service and the necessary grocery shopping prior to arrival. Quiet upscale residential area, only local traffic, dead end. In the vicinity of vineyards and trails sheltered by nature Lössholgassen as Cycle through magnificent orchards bags to the nearby Rhine and the Kaiserstuhl or the Alsace. The swimming pond in Endingen and is free and the lakes in the vicinity, swimming pools are about 15 - to reach 20 km away. The three corners of the country offers innumerable worth seeing excursion destinations, southern Black Forest, Baden and Alsatian wine route, the Europapark Rust is approx. 18 kilometers away. The Konus guest card you receive with us costs € 1.50 per person per day and corrects you to the free train and bus ride. For bookings under 7 days, a short-term surcharge of 10.- € per day is payable locally. Enjoyed our stay in Endingen. We just needed a small place and it suited our needs perfectly. 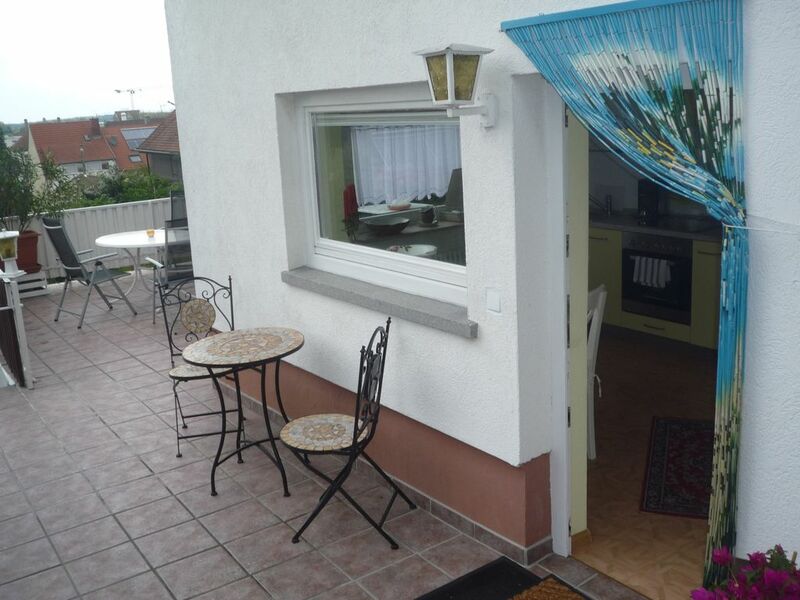 Ingrid was very accommodating and we were close to the town centre in a quiet residential area. Great value for the money. As described it is a cozy (compact) apartment but has all that you could want and is nicely located for exploring the area. One minor inconvenience is that there is no dedicated parking and you have to take pot luck as to how close to the apartment you can get parked. Schade, dass das Bad nur durch das Schlafzimmer zu erreichen ist. Schlecht für Frühaufsteher wie mich. Da wird der Partner wach wenn man rein muss. Ansonsten fehlt nichts. Toller Ort, Einkaufen super, Freizeitmöglichkeiten ohne Ende. Vier Tage waren viel zu kurz. Ganz nette unaufdringliche Vermieter. Die Wohnung wurde mit viel Liebe eingerichtet. Die Gegend hier am Kaiserstuhl sehr schön. Uns hat es gut gefallen, es ist alles vorhanden, was man braucht. Schöne Terrasse mit morgendlicher Sonne und dann Sonne ab 17.00 Uhr, es war herrlich Die Vermieter sind stets bemüht, ob was fehlt.